Today was window washing day! When we built our house, one thing Country Guy and I agreed on was that we couldn't have too many windows. Since we live in the middle of a woods we have a wonderful view from every side of the house so we wanted to be able to see it. Many people came to watch the progress of the house as it was being built and invariably the question would be asked, "Who is going to wash all those windows?" I found the question a little annoying and usually told them I was going to wash the windows, but even if I didn't there would be much more light in the house than if we didn't have all those windows. I actually enjoy washing windows. They always look so beautiful when I'm through. 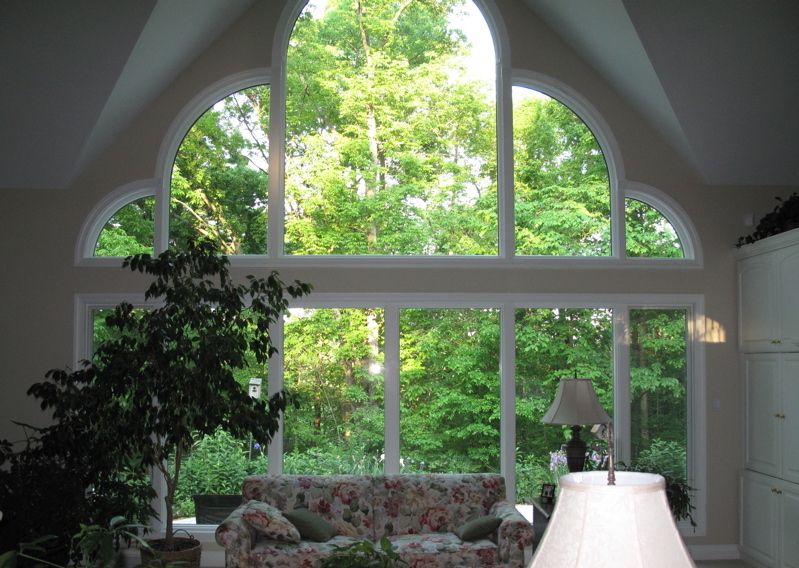 I only have two windows--the huge one in the living room that is 18 feet tall, (see photo below) and one upstairs that is 3 stories off the ground that I don't like to wash. I have the kind of windows that crank out and then you reach out to wash the outside from the inside, but since the upstairs window is so far off the ground I get a little uneasy when I wash it that way. Today I only got the inside and outside of the first floor done. Hopefully, I will have time later in the week to finish but at least the ones I see most often are sparkling! We are planning to have our first Sunday morning meeting of the new adventure--we hesitate to call it a church because we don't think it is going to look like a traditional church--at our house this weekend so it seemed like a good time to get the windows clean. For any of you reading this who live in our area, the meeting will begin 9:30. We would love for you to come experience the body of Christ meeting in a way similar to the New Testament Church. We are excited to begin. Patrick Henry Hughes - What an inspiration! Several people have mentioned they are still having trouble commenting on my blog. I love to get comments—it makes writing so much more interesting when I hear from you--so I hope you will continue to try. I am wondering if part of the problem could be what browser is used to get on the blog. I have noticed that if I am logged on with Firefox the print on the blog is entirely different, and not as large as it is when I am logged on with Safari, which is my preferred browser. I have no idea why this is. I have tried to change it, but I cannot make it look the same no matter what I do differently. Could it be that if the whole set-up looks different on different browsers then there is a chance that the process of commenting could be different, too? If you would email me the problem you are having I might be able to figure out how to fix it, or to change some of the settings on the commenting section. It is so disappointing to miss any of your comments. I really do want to make it easy for you. You may have noticed I haven’t posted much this week. We are returning from Nebraska as I write this. Country Guy had some work to do for a friend/client so we left Wednesday and drove to Des Moines in order to arrive in Omaha Thursday a.m. We went to lunch & dinner with our friend, Vilma, and then stayed with her Thursday night in her beautiful house. We were also able to spend some time with two of her boys and to meet their girlfriends. Then Friday I went to visit friends, Ned & Marcia, while Country Guy attended a meeting with one of his former law partners. He returned later to spend the afternoon with us. We enjoyed our time with them very much since we hadn’t been together for a year, or more, and therefore had a lot of “catching up” to do. We even spent a little time reminiscing about our wonderful trip to Greece and Turkey with Ray VanderLaan we took together several years ago. We then spent Saturday with our daughter and her family in Milford and had lunch at the Pizza Kitchen--Country Guy’s all-time favorite pizza! We were interested to see how much had been done on the new house they are building since we were last here in July so we spent the morning at the building site, which is located in the country. It is a perfect place for the little boys to roam with a woods and a creek running through the property and the house is going to be beautiful! I am particularly interested in watching it being built because during the planning stage Jess asked me for suggestions on how to make their house plan even more efficient, since she knows I love to do that. I put her plan on the 3-D Home Architect design program I used when we built our house, and found space for several more closets and a more efficient kitchen. I really enjoy doing that! So if any of you reading this are contemplating a new house and would like me to try to improve the usability of your floor plan just email it to me and I’ll see what I can do. I would be delighted! Saturday night we had dinner with friends, Fred & Charlyn, at Wilderness Lodge in Lincoln. It is a beautiful rustic place, in a gorgeous setting, with exceptional food so eating there is a wonderful, multi-faceted dining experience. We went back to their house for continued discussion of our lives’ happenings since we were last together, and to pray. We love praying with Fred & Charlyn and have had some remarkable times together with them in prayer! As we prayed for the new adventure we are feeling called to in Martinsville it seemed a good idea for them to consider coming to talk with our group about their experiences along those lines, so they are checking in to it. It was a wonderful weekend of “catching up” with friends, making it an all-together enjoyable, satisfying and productive trip, packed full of renewed relationships. Hopefully, once I get home I will have time to post more regular updates on my blog. But then who knows what next adventure awaits that may disrupt my plans? This came in my email today. I found it informative and humorous. The hydrangeas were wilted and some of the plants in my newest garden were looking stressed so I had to break out the garden hose today. I watered the courtyard garden with a water sprinkler, moving it every couple of hours, because it is the thirstiest of my gardens. It is the only one that is not mulched because it is very flat with a slight incline back toward the house, so in the springtime it stays extremely wet--so wet in fact that I dug a meandering ditch through it to funnel off some of the water. It would never dry out if I mulched it. Because of the mulch, the other gardens are not quite as dry, so I am going to hold off watering them completely as long as I can, and continue to pray for rain. My newest garden which is located too far from a hydrant to use a garden hose. 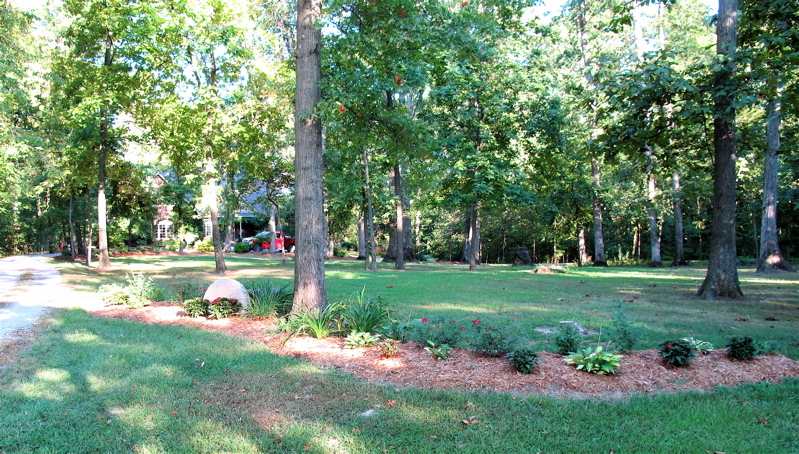 I have several hydrangeas planted throughout my gardens, though, which are very sensitive to drought. So today I carried buckets of water to the hydrangeas, the garden at the front of the yard which I planted last year, and to the young trees and bushes I planted or transplanted this year. (I must admit I felt a little guilty about watering some of the plants when those next to them had to be thirsty, too.) Fortunately, I had my trusty Mule to help me. I filled 6 five gallon buckets at a time and made at least 7 trips---but who is counting. :o) That adds up to lifting and carrying over 200 gallons of water! It certainly is a good way to do strength-bearing exercises! I so much prefer to do work as a form of exercise, though. I could never force myself to go to a gym! How blessed I am! Watered plants, contributing to strong arms, and an opportunity to enjoy nature all at the same time! And I'm sure those thirsty plants are happy, too. Don't you love to worship the Lord? I am sitting here immersed in beautiful music as I try to find songs for our fellowship group meeting tonight. As I played various songs I was thinking what a wonderful privilege it is to meet with friends to worship the Lord, and to pray, and to discuss the new understanding of Himself He has shown us this week. How often I take this for granted! Sometimes I even let it become so routine that I allow it to become just another thing to do and I don't anticipate coming together. Sometimes it slips totally out of my mind that when we meet together we are coming into God's presence. He is waiting and eager to be with us. He said, "When two or three are gathered together in My Name there am I in the midst of them." I think if I could ever understand deep in my heart how much God enjoys being in the midst of His people, and how much it pleases Him for us to gather, I certainly would be much more eager to meet as often as we could. Holy Spirit help me to remember, and to anticipate coming into God's presence--and to make it a priority. Since this is the season for excess tomatoes, I thought you might find this information helpful. It arrived today in my email box from Cook's Illustrated. Published July 1, 2008. From Cook's Illustrated. How can I prolong the shelf life of a tomato? We’ve heard that storing a tomato with its stem end facing down can prolong shelf life. To test this theory, we placed one batch of tomatoes stem-end up and another stem-end down and stored them at room temperature. A week later, nearly all the stem-down tomatoes remained in perfect condition, while the stem-up tomatoes had shriveled and started to mold. Why the difference? We surmised that the scar left on the tomato skin where the stem once grew provides both an escape for moisture and an entry point for mold and bacteria. Placing a tomato stem-end down blocks air from entering and moisture from exiting the scar. To confirm this theory, we ran another test, this time comparing tomatoes stored stem-end down with another batch stored stem-end up, but with a piece of tape sealing off their scars. The taped, stem-end-up tomatoes survived just as well as the stem-end-down batch. Storing a tomato stem-end up allows air to enter and consequently loses moisture, shortening shelf life. Storing a tomato stem-end down (room temperature is best) prevents air from entering and moisture from exiting its scar, prolonging shelf life. I guess Dad must have done his own testing (see previous post here) to come up with the same conclusion--Maxwell House was the winner. Praised as “mellow and smooth,” our top-ranked brand was neither acidic nor harsh. Tasters liked its “detectable complexity, with a slight nutty aftertaste,” “like dark chocolate,” describing it as “fruitier” than other coffees in the lineup. I posted a new prayer request on the Prayer Request page, but wanted to post it here, too. Our friend, Sam Iverson, who recently had open heart surgery, has discovered he has fibrosis forming in his lungs. The prognosis is not good. He will be going to Mayo Clinic as soon as possible for a second opinion. Please pray for complete healing for Sam and for strength, hope and renewed expectation for his family. This word from Francis Frangipane says much about what the Lord seems to be saying to us as we contemplate and seek His direction for something new in Martinsville. Since a lot of the conversations in our area right now have to do with crops because of the lack of rain, the title caught my attention. After reading it, I thought it was worthy of posting. It seems that so much of Christianity has revolved around "saving souls" and "getting people into heaven" when Jesus said we are "to go and make disciples." A disciple is someone whose desire it is to be just like his teacher. We are to be Jesus to those around us. How can we do that unless we are changed into His likeness? We don't yet know what means God will use in His work here, but we are certain that His goal is for us to learn to be disciples of Christ, getting to know Him, letting Him live in us, helping us to do what He did, so that others will see and want to know Him, too. We invite anyone reading this, if you live nearby, to come be a part of this new adventure. Certainly, the period prior to Christ's return will be both difficult and perilous. Scripture warns that God's voice will shake all things, things in the heavens and things upon the earth. Everything that can be shaken, will be shaken and removed (Heb. 12:27). Yet, there is more on the calendar of God than increasing judgments and the rapture. There will also be the advance and establishing of God's kingdom (Dan.2:44; Matt. 24:14; Matt. 13). A spiritually mature people will serve as the vanguard of His kingdom. Before the Lord is glorified in the earth, He shall be glorified in the church (see Isa. 60:1-3; Eph. 5:27). Indeed, the attainment of Christlike maturity in those who pursue the Lord shall not be a mere sidebar on the scroll of end-time events; it will be the main attraction. Listen carefully to what Jesus taught. He said, "The kingdom of God is like a man who casts seed upon the soil; and goes to bed at night and gets up by day, and the seed sprouts up and grows how, he himself does not know. The soil produces crops by itself; first the blade, then the head, then the mature grain in the head. But when the crop permits, he immediately puts in the sickle, because the harvest has come" (Mark 4:26-29). Jesus likened the kingdom of God to a farmer waiting for the maturing of His crops. During the harvest season, farmers are concerned about two primary things: the quantity and quality of the harvest. I live in eastern Iowa. Some corn and soybean fields, which may have started strong, fail or are stunted due to unusually high or low temperatures or lack of rain. As a result, farmers plow under their fields because their crops did not reach maturity. There was no "mature grain in the head." Just as the farmer will not harvest without the grain becoming mature, so God is seeking a crop of Christ-followers that have reached spiritual maturity. God is after full stature not just full numbers. Take note: Jesus said, "when the crop permits," God puts in the sickle. The return of Christ isn't about a certain "day or hour," for it is the spiritual stature of the harvest that triggers the great unfolding of end-time events. You see, God is not looking at His watch; He's looking at His crop. What does spiritual maturity look like? Recall Paul's words. He wrote, "We are ready to punish all disobedience, whenever your obedience is complete" (2 Cor. 10:6). What does complete obedience look like? It looks like Christians taking "every thought captive to the obedience of Christ" (2 Cor. 10:5). Again, God is looking for Christlikeness to ripen within us as we approach the end of the age. Indeed, our maturing can actually hasten the coming of the day of the Lord (2 Peter 3:12). "Man...in the image of God" is the seed-idea purposed by the Almighty from before time began (Gen. 1:27). It does not in any way mean we think we are gods or that we take Christ's place; it means Christ has truly taken our place (Gal 2:20). The original plan was for man to be conformed to Christ. This is what the "mature head in the grain" looks like: mature Christlikeness. For too long we have assumed that only the numeric size of the harvest was the focus of the Father. Certainly, the number of people saved is pivotal: "the fullness of the gentiles" must come into the kingdom (Rom. 11:25). However, the Almighty does not just want numbers; He wants spiritual maturity. Thus, the Lord is not looking at a calendar thinking, "Oh, it's the year 2011 (or 2020, etc.). I have to destroy the world on that date." No. A farmer does not reap his crops without first walking his fields, holding samples of the grain, and studying the moisture and integrity of the seed head before he begins his harvest. Again, the maturity of the crop determines the day of the harvest. So many Christians are frozen in spiritual immaturity. They are easily offended, often distracted and without prayer or spiritual discipline. We think God is requiring of us simply to hang on, yet the Lord is looking for more. Paul says the goal of God in the church is that "we all attain to the unity of the faith, and of the knowledge of the Son of God, to a mature man, to the measure of the stature which belongs to the fullness of Christ" (Eph. 4:13). Even now, believers around the world are becoming increasingly more Christlike. They live in India and China, Africa and South America, Europe and North America, and places beyond. Yes, they are comparatively a little flock, yet "with unveiled face," they are "beholding as in a mirror the glory of the Lord" and "are being transformed into the same image from glory to glory" (2 Cor. 3:18). When this crop permits, the Father shall put in His sickle for the harvest has come. Let's pray: Lord Jesus, as You continue looking for spiritual completeness in the harvest, help me to grow to full stature, that I may truly represent a planting which has grown up into Your likeness. After talking with our visitors from Texas this weekend I feel almost selfish posting this request asking you to pray for rain for our area, so I ask you to include Texas and every other area that is in a drought in your prayers. The crops here are at a very critical stage. They have already been hurt by the lack of rain, but if there isn't rain very soon many of the fields of soybeans are not going to produce anything and the corn will not mature--just dry up on the stalks. Country Guy walked out into a field over the weekend and brought back a pod from the bean plants. It had no beans in it. Only rain will cause it to fill. Our new friends from Texas were telling us they had 40 days in a row when the temperature in Dallas/Ft. Worth was over 100 degrees. This was broken by one day of 95 degrees, and then the 100 degree days began again. Those temperatures are forecast for at least the next 10 days! I'm sure that everything there has been burned up by the sun! We still have some green plants in our area, but are having to water all the vegetable and flower gardens. Please, Lord, let it rain! I can't believe how difficult it has been to enjoy God's beautiful creation because of the weather this year! In the spring we had so much rain we were afraid we couldn't get the crops planted. Once we finally did, and the crops started growing, it virtually stopped raining. I was trying to recall the last good rain we had. The last one I can remember was the night of Elevate 2011, when we had to end the concert early because of a huge storm headed our way--that was June 25! I love the sound of rain--except when we've already had too much. I can't wait to hear it again and to smell that wonderful fragrance. Please pray with us that it will come soon! We are still exploring the potential for a new 'work' of some sort here in Martinsville. A young couple from Ft. Worth, Texas, came this weekend, and will be here through tomorrow, to talk with us about what we think God may be calling us to do, and to determine if He is also calling them to be a part of it. Since all in the group see this as a new thing, we don't know what it will look like yet, but we are hopeful and excited. We are praying that soon we will have more clarity on how to proceed. As I seem to say often, "Walking with God is a great adventure," but it takes faith and patience and determination to hear Him clearly. And then we must obey what we have heard. It will be interesting to see where all of this is taking us. I am having trouble keeping up with everything lately, which includes posting on my blog! Sorry. I do believe I will get better, but it may not be till winter. Who knows? In the past two weeks, I have been to Nebraska, Alabama, spent much time straightening out the cell phone fiasco, and now I am preparing for guests this weekend. Besides all this, the corn was ready last week so I put almost 30 packages in the freezer, and then the tomatoes decided to all ripen at once this week. Wednesday and Thursday I made spaghetti sauce for the freezer--the equivalent of 18 regular sized jars. (I posted the recipe I use on the Recipe page under "Miscellaneous" if you, too, are being overrun with tomatoes.) What a mess I make when I do tomatoes, so even clean up is time consuming! I'm sure your life is just as full and as busy as mine. Aren't you grateful? It is a wonderful blessing to have places to go and things to do and people to meet! I am just having trouble prioritizing because I want to do it all. Have a great day today in the midst of your the busyness! I'm planning to! I wonder what new adventures await. For any of you who care to know, I solved my cell phone frustration the way it should have been done in the first place. I went back to our old carrier, CellularOne. Yesterday I sent back my iPhone, cancelled my Verizon contract and got a new Samsung Galaxy phone that works just like an iPhone with CellOne. What a relief!! I had a long conversation with our daughter who said I sounded clearer even than I had on my previous phone with CellOne. Hallelujah!! It is amazing how a little thing like disruption of cell phone service can cause me such frustration and unrest till I get it fixed. I certainly have not learned how to give thanks in all things yet--even though in hindsight I can often see the Lord working through it all. I wish that would be my first reaction. I believe with my head that He works all things together for my good, but while I'm going through it I sometimes get exasperated at the circumstances I have gotten myself into. I guess that is the key, isn't it? I "have gotten myself into"--doing something without asking the Lord to guide me. In this case it was impulse buying because my phone was broken and I was without one in Nebraska. How much less hassle my life would have had if I had been patient while seeking the Lord to guide me in making this decision. How much better my life is when I remember to do this! We are back again from a wonderful weekend in Birmingham, Alabama, where we attended a Dallas Willard conference. It was so inspirational and encouraging! Dallas has such a fine mind and such a clear, concise way of describing what he believes that it makes the complex seem simple. That's the way it is with truth, isn't it? When the Lord quickens a truth to me in the Bible it seems as if it is so simple that everyone surely already knows it, and I am only now realizing the significance. I love it when that happens! There were so many times that happened this weekend! The underlying theme of Dallas' ministry is that the Christian life is to be a life of discipleship--we are learning to live as Christ lived through His power as He lives in us. Christianity is not just a way to get to heaven when we die, but a way of life. He continuously reminded us that Jesus came to give us "eternal life", but a better way of looking at that term is to translate it "eternal living." We are learning skills here on earth that will help us when we go to heaven. He suggested that we tell ourselves that "I am an unceasing spiritual being with an eternal destiny in God's great universe," therefore Jesus' companionship and instruction are standard and necessary. It is all about relationship with Jesus. It is walking and talking and living with Him as reality, not just thinking He is our ticket to Heaven. Another "gem" from Dallas' teaching was the statement, "Don't try to keep the law--try to become the kind of person who keeps the law." It is an internal affair, not externally trying to implement rules and restrictions. I purchased another Dallas Willard book, Renovation of the Heart, which I am eager to begin reading. I have learned so much from The Divine Conspiracy, I know I will delight in this one, too. Not only did we get to participate in a wonderful conference, and attend an Anglican church service which we had never done, but enjoyed very much, but we got to spend time with friends. Our friends, Lonnie & Debbie, went with us so we had lots of time for long conversations on the drive down and back, and then while we were there we had dinner with two other couples who have been dear friends since the days of Tommy Tyson's Aqueduct Board--the Terrys and the Hutchesons. It was so good to see them again and to catch up on what has happened since we last met. It was an all around perfect trip! This is an encouraging word from Francis Frangipane in many ways, but one that really strikes me is that we need to remember that those in a coma can probably hear us even if they are unable to respond, and therefore we need to treat them as if we are certain they are listening and to speak encouraging and loving words in their presence. The pride and isolation that had, throughout his life, stood guard over his heart were gone. A physical catastrophe had overtaken him. Death approached, and he knew he was unprepared for eternity. Submerged beneath his motionless exterior, a war had raged for his soul, which the Lord won. Subdued by the relentless force of God's love, he was finally at peace. It was during his time in the hospital that he had silently prayed and accepted Christ as his Savior. I was watching his last effort to tell them as life ebbed out of his body. "Tell them he's with Me." God is Good Although some time has passed since I first had this dream, I am increasingly aware that many of God's people carry a deep abiding heartache concerning the death of an unsaved loved one. Obviously, this dream does not apply to all, but there are some for whom this experience is divinely directed. Thus, I submit this to you in a general sense, because the Holy Spirit has assured me He will bear witness to your heart that this word is for you. I have also felt an urgency to pass this dream on to you. The Lord has an important work for you. However, the enemy has used this unresolved loss to sow doubt into your soul. Not only are you troubled about your deceased loved one, but you are carrying doubts about God's love, and you doubt also the power of prayer. Your confidence in God has been compromised. Yet, it is precisely at this time that you need to stand without doubt for other members of your family. Additionally, some of us have lost loved ones in sudden tragedies, where they seemingly had no time to repent or turn to God. Let me remind you of those who have faced near-death experiences. They tell of seeing their "life flash before [their] eyes." Indeed, they say that time itself seem to stop or move into slow motion. I believe that, even in what seemed like a "sudden" death, time slowed to a crawl. According to their testimonies, evidently, there often is enough time in this altered state to see and ponder one's entire life - and to make a decision or even call upon the name of the Lord. Lord Jesus, thank You for dying for my sins. Lord, there are many issues I do not know, but I do know that You are good. Those things I do not understand, I give to You. I trust You with my life, and I put in Your hands the care of those I love. One of the things he said while I was listening that I had to write down so I could think about it and remember was "God does not make himself obvious because of the need to allow human desire and will to go it's way (My interpretation--In other words--to make their own choices) because that is what defines human character. Character only develops with freedom...God is present, but in ways that anyone who wishes to deny can deny...That is the reason Christ spoke in parables and was born in a manger." It seems that just about everything he says is thought-provoking and mind-expanding. I can hardly wait for the conference! In the meantime I have also decided to begin re-reading his book The Divine Conspiracy, which I know will take me awhile because it is so good and has so much to think about on every page. I am eager to learn all that I can from this man who seems to me to know more about being a disciple of Christ than most anyone alive today. Are you familiar with Dallas Willard? What are your thoughts concerning him? Well, as I had feared the cell phone reception with Verizon back in our woods is not nearly as good as our CellOne reception was. I convinced myself it would be OK because we have had several people, including our sons and their wives and others who have stayed with us, use their iPhones at our house and none complained of poor service. But my words are sometimes garbled and occasionally a call is dropped when I have made and received calls the past few days. So now I am trying to decide what to do about my new iPhone. I love it, but only if I can use it! I'm sure you're thinking, who would keep a phone that doesn't work properly? Those are my thoughts, too. I would return the phone and sign-up for CellOne immediately if it were just my phone to consider, but Country Guy says he is happy with his. (I wish he would get a few more calls when he is home so he could see if he is really happy with his or not.) Since most of my calls are made and received from our house, I have had lots more opportunities to see the problems. To make matters worse we bought the phones, and the plan, at a corporate store in Lincoln, NE, while we were visiting our daughter. I took mine in to the local store here and was informed they can have nothing to do with the iPhone, only corporate stores are allowed to sell them or service them, and the plan needs to be cancelled at the store where it was purchased. That means if I decide to return mine I have to ship it back to NE. Since Country Guy's phone is on the same plan he will probably have to return his, too, and re-subscribe. So it becomes rather complicated when considering how to do that and not disrupt service and keep the apps, contacts, etc. already entered in the phones. Someone mentioned the anetenna for the iPhone is around the outside edge and is touch sensitive, so I went to Terre Haute and purchased a new case for it that protects the edges in hopes that would work. Yesterday I was able to carry on a few conversations without interruption and had almost decided to keep the phone since it seemed to be working fine. Then this morning as I was talking to Jess, she said she would call me on my house phone because my words were becoming garbled. This is so frustrating! I was told there are cell phone signal extenders that might help inside the house. But how will I know till I purchase one? I have only one more week to decide what to do because there is a 2 week cancellation clause in our cell phone plan. Any suggestions? Why does life have to be so complicated when all I wanted was a phone? I think I listened too much to all those iPhone users who were raving about their phones instead of using common sense to stay with the service that worked so well for me. Maybe this post will help others who may be tempted to get one of those snazzy phones, to think through their decision a little better than I did. I am still holding out hope, though, that I can keep the phone, and not go through all that trouble!! Many indicators seem to be causing us to believe the Lord Jesus is calling those in our house group to start something new in Martinsville--another "community that expresses God's nature." We are weighing the coincidences and the words, and the impressions, and praying about them. We know there is a lot of work and headaches to starting something new and fresh from the ground up, but also a lot of joy and excitement in seeing people blessed. We have been praying for confirming words and a knowing in our hearts this is what we are to do. Last week a friend called to say she was excited for us because our pastor had announced in church that the Lord seems to be calling us to a new adventure. As we talked, I mentioned our hesitation because of all that is involved in the process and that we would miss going to the church we've gone to since we moved to Illinois. She made a statement that seemed to go right to my heart. I felt as if God was speaking directly to me. Have you ever had that experience? The statement she made, which every Christian knows but we forget to act on, is that this life is not about sitting in church and being comfortable, but it is about introducing people to Jesus. I think I have gotten too comfortable sitting in church. One of the things we have been discussing as we seek the Lord's Will in all of this, is that there are over 16,000 people living in this county, and as best we can determine, only about 5,000 are members of a church. That leaves a lot of people who have never heard the gospel in a way that makes them want to be part of the body of Christ. We are praying that other churches will be excited about the prospect of something new coming to the neighborhood, too. Since our purpose in life is to help other people know Jesus, isn't it exciting to have even more people trying to fulfill this? Our intention would be to reach those who don't already attend a traditional church. We don't want to take people from churches who already are a part of the body. I have often pondered the reason for so much variety in churches and denominations. It seems to me that just as each of us prefers a particular color, or flowers, or bird, etc. we also have different preferences in the way we worship God. We see Him differently and worship Him accordingly. I believe He is pleased by that. He is a God of creativity, not sameness. Each church or denomination seems to emphasize a different part of Him and relates to Him in that way. That is wonderful! I don't think He is pleased, though, when we begin to get exclusive--thinking ours is the only way. How do we so easily forget who He is when we have all the magnificence of creation to remind us of the diversity and beauty of its creator? Won't it be wonderful when the body of Christ represented by the various denominations and churches begins to see that we have a common purpose and that we can work together to fulfill that purpose? There is no need for competition. I pray we will begin to work together in harmony and unity to see that "God's will be done and His kingdom come on earth as it is in Heaven." If things progress as it appears they will, I will do a future post with details of the coincidences, words, and direction we have been receiving in the order they have come, so that you can also see how we have come to the conclusion that God is calling us to step out and follow Him wherever that leads. Please pray for us and for those who will be part of what God is doing. We want it to be said of us that there is a another "community of believers who express God's nature" meeting in Martinsville. It is an exciting adventure to follow the Lord!